The patient was referred to our practice by his family physician with a chief complaint of drainage in his mouth and facial swelling for three weeks. Antibiotics had improved the patients condition. In addition, paresthesia of the mental nerve distribution was reported on questioning. The patient is a 68 y.o. white male allergic to Reglan. Medications Procardia and Zestortic for hypertension. Prior operations included an inguinal hernia repair, lumbar disectomy, and excision of a small squamous cell carcinoma from the patient's back. Laboratory data was within normal limits. Oral examination revealed gingival erythema and gingival edema. A draining fistula was noted in the left mandibular retomolar area, that could be probed to a depth of 15 mm. There was no bruitt or thrill. The maxilla was edentulous. The patient had a complete maxillary denture. Dental calculus was present on the lingual surfaces of the mandibular incisors. Teeth #'s 21 and 28 were carious. Class III mobility was present for teeth # 21, 24, and 25. Radiographic examination revealed mandibular horizontal alveolar bone loss and dental calculus. Teeth #'s 21 and 28 were carious. Tooth 17 was impacted with a distoangular inclination. A large radiolucent lesion was associated with the crown of # 17. The radiolucent lesion encroached upon the inferior alveolar nerovascular bundle. Admission to OMHS Out-Patient Surgery Dept. 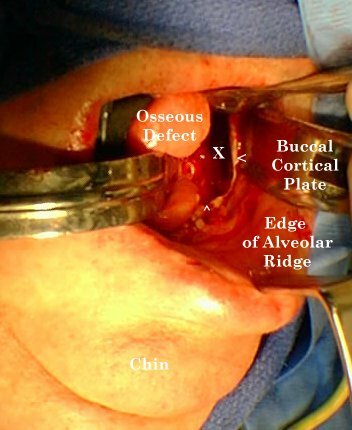 Intraoperative digital photograph of mandibular ramus osseous defect following enucleation of dentigerous cyst. Digital photograph of tooth # 17 and mandibular dentigerous cyst following enucleation. Digital photomicrograph of histopathologic slide. Cystic lumen, epithelial lining, and connective tissue are noted.